Connect your APM via micro USB cable. Install Mission Planner from here. 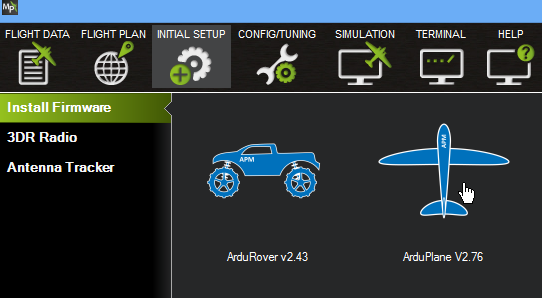 If not already done, install APM firmware. 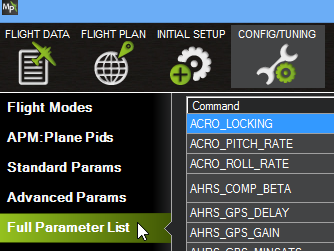 Go to full parameter list. Connect an OrangeRX module via FTDI cable. The Ultimate LRS Control Center main screen appears. Click on the ‘firmware upgrade’ tab. Click on the ‘Upgrade firmware’ button. The firmware gets uploaded. The HK 1W and 100 mW modules are supported. The popup will close when the parameters are correctly saved. I’ll add a complete disclaimer, but basically it’s an experimental system and you have to understand that you use this system at your own risks and under your own responsibility, you’ve got to ensure to comply with all regulations applicable in your country. Don’t do anything forbidden, stupid or dangerous. In particular, for now it’s possible to select frequencies which are outside of the ISM bands, and the power can be too high for several countries. 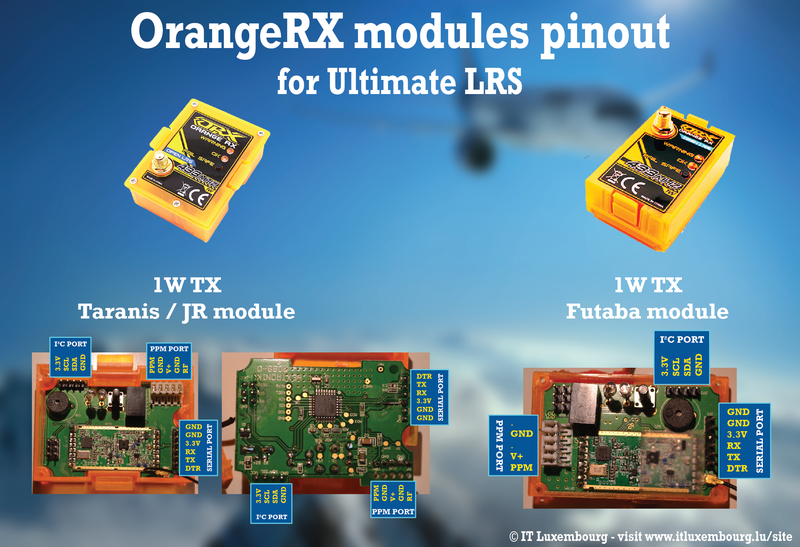 The OrangeRX modules have a CE certification provided by HobbyKing, but no FCC certification. WinAVR is required, normally ULRS CC will provide you with a download link if it’s not installed yet. It expects to find it in its default installation folder c:\WinAVR-20100110. On each module, one LED means ‘receiving’ and the other means ‘transmitting’. If everything works fine, all LEDs will blink. The blinking is always at the same rate, which if chosen for good visibility. It doesn’t correspond to packets transmitted, which would be too fast to clearly see the blinking. The fact that one LED is marked ‘warning’ can be confusing, but having one LED for transmit and one LED for receive allows to debug faster any communication issue. For example if the RX module is broken for any reason, you’ll see only one LED lit on the TX module because it won’t receive any data from the RX module. Have a look at the FAQ, it provides many tips on how to improve your range. Notice no binding is needed, it just works out of the box. RSSI is available either as analog signal or as a servo value on any channel. Please check this page for more information. If you need more that just the length of your FTDI cable, you can use a long cable to connect the TX to the computer. You can also consider using Bluetooth as described here. Connect a 5 meters USB cable to the computer, and have the FTDI adapter near the TX. 5 meter is the maximum as per USB specifications, else you’ll have to insert an USB hub before going another 5 meters. or you have the FTDI adapter on the computer, and have a long serial cable. I’ve used 20 meters cable without issues. Know more about the project history here. 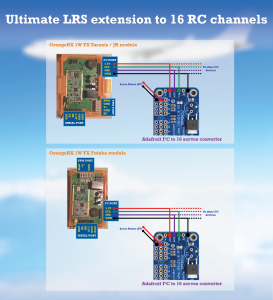 ULRS provides a 16 channels PPM signal, but you can also use an external module to have the 16 servo signals : link.